Amazing! I leave for a couple weeks of camping and visiting in New Mexico and Colorado and it’s like I’ve returned to a completely different farm! Check it out ladies and gentlemen–there is only ONE bunch of combined chard, kale and collards. I might actually be able to make recipes this week that don’t have kale slipped in somewhere. So as I drove home drinking in the garlic/onion, fresh tomato, basil perfumes, contemplating my bounty, I realized I had completely forgotten how to make anything without greens. 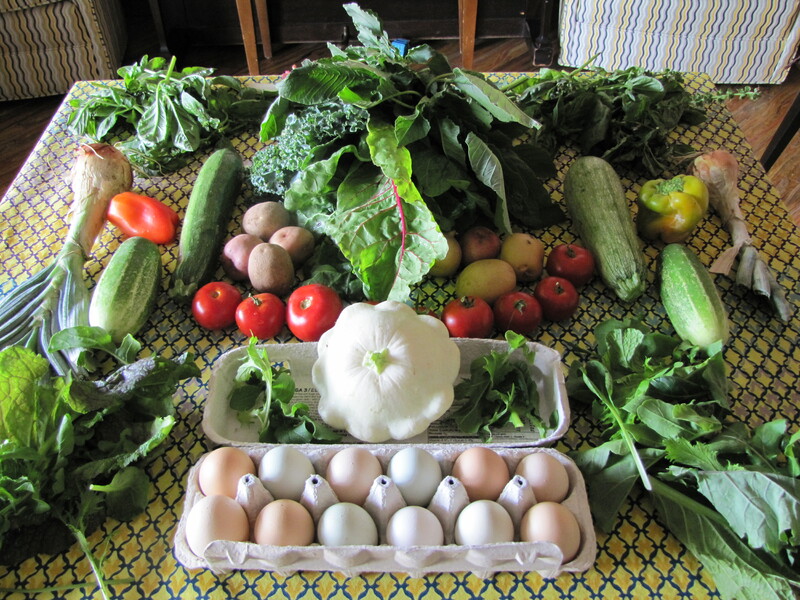 Luckily, this week’s share also featured a beautiful bunch of amaranth greens so I thought PERFECT! 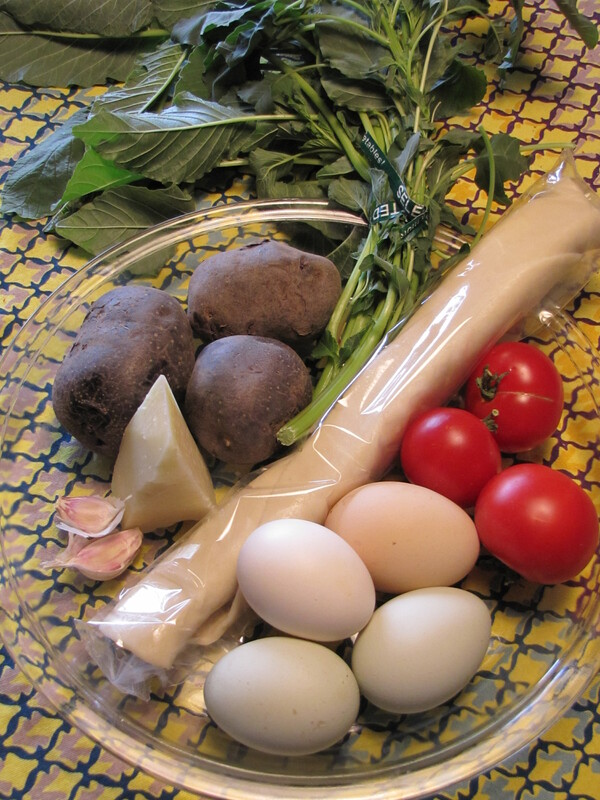 I’ll make a summery greens dish! 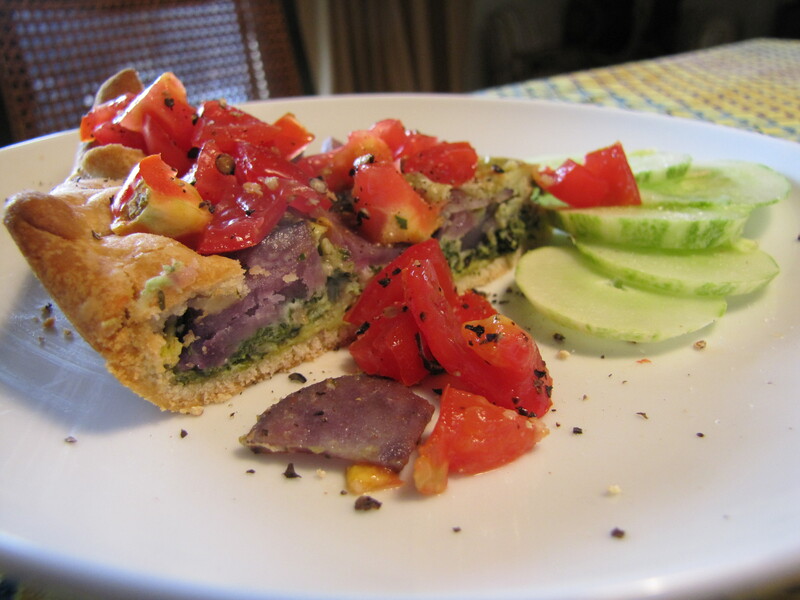 And after a little consultation with my morning yoga (ahem, read pedicure today) pal, it was decided that a savory tart was on the menu for lunch. Lucky for you folks, it was deemed delicious (read “not bad” in 13yo speak/actually eaten rather than thrown across room by 2yo) according to the family critics so I get to share the recipe with you! 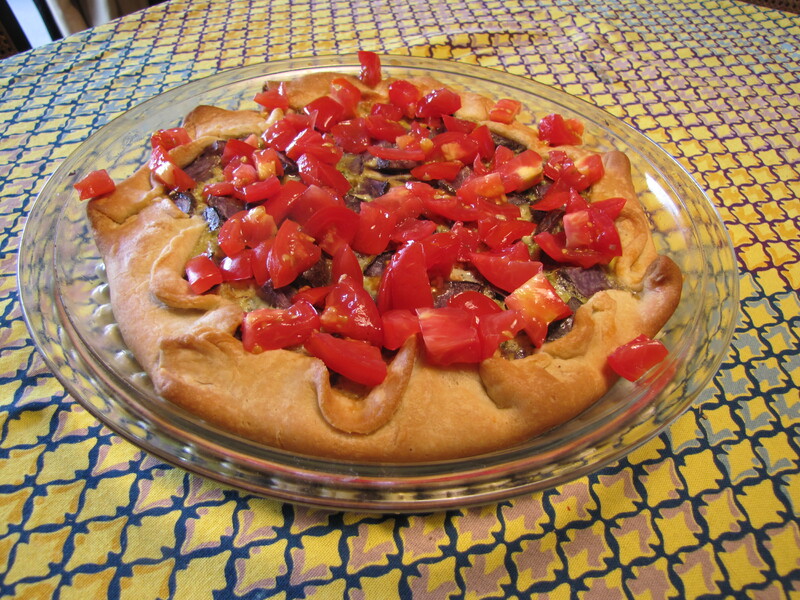 First of all, I decided to make a “galette” rather than a tart. A galette is just a free-form tart, which means you simply flop the sides of the crust over instead of neatly crimping. It also means you can roll it out in any shape you want and bake it on whatever’s at hand (cookie sheet, pie plate, etc) which is really a bonus when making your own crust, especially for inept perfect circle rollers/disorganized bakery cupboard possessors like me. 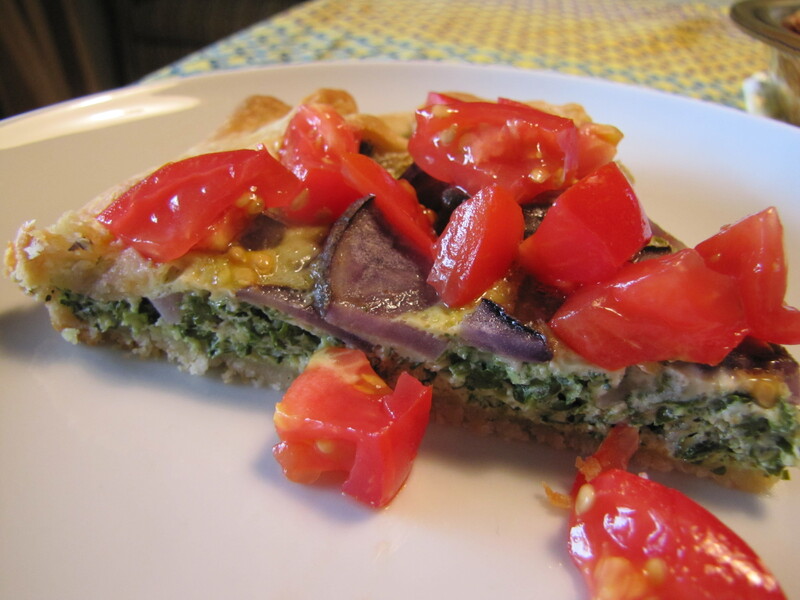 Lucky for you, this is a lazy summer recipe which features a store-bought crust from Immaculate Bakery (they were on sale!). Also lucky is that this took me about 10 minutes to throw in the oven and another 23 minutes to bake so actually qualifies as fast and easy in my book! Amaranth greens have a wonderful flavor which can best be summed up as “very greeny”. They have no bitter undertones and can be thrown in just about everywhere. To me, their only small challenge is that they can be a bit fibrous, so I generally like to chop them up quite a bit so you don’t have any food-falling-apart-because-one-leaf-won’t-let-go issues (particularly important in tarts!). 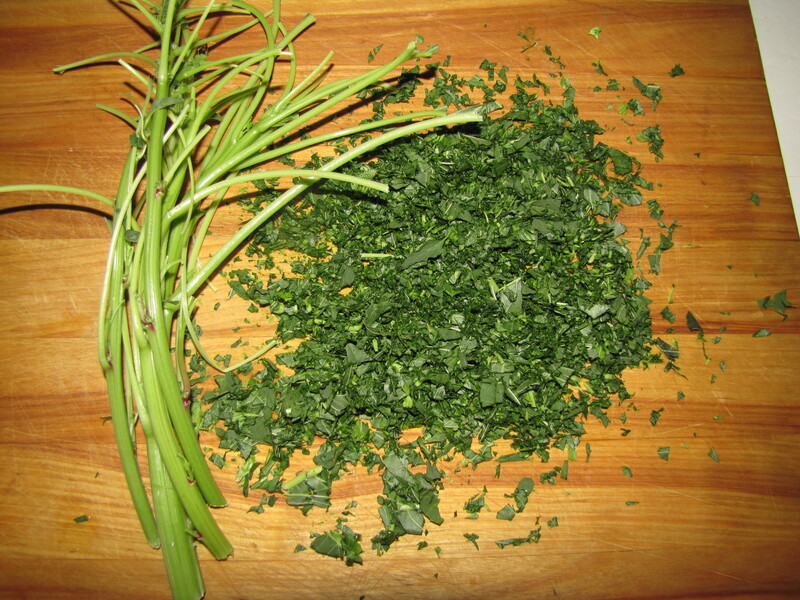 Here, I de-leafed the whole bunch and ended up with about 1 1/2 cups of chopped amaranth greens. I put the stems back in the fridge to throw into something else later. 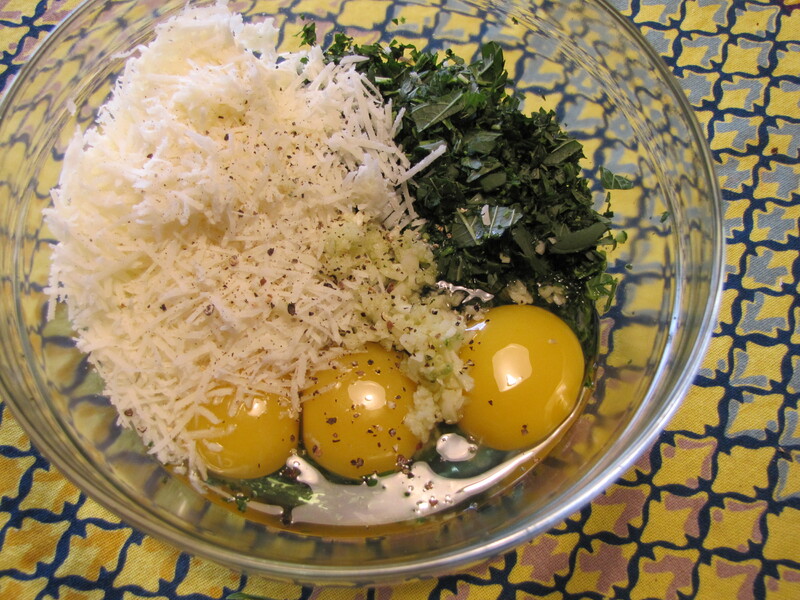 To the greens I added 2 cloves of minced garlic, about 1/2 c. grated romano, 4 eggs and some fresh ground pepper. I gently mixed this together with a rubber spatula and then spread it out on my unrolled pie crust (expect amaranth mixture to be quite thick). 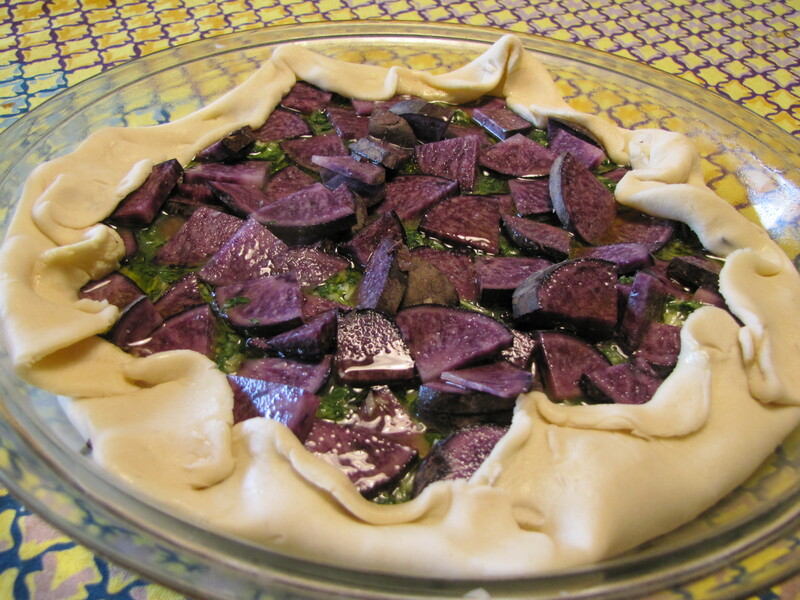 Then I quartered and sliced 3 small purple potatoes and tossed them on top. Lastly I flopped over the crust edges, salted and drizzled with olive oil. I don’t think it’s necessary to point out the incredible joy of having freshly dug purple potatoes. This particular batch hails from Sleeping Frog Farms, because I chose to get the mixed gold and red potatoes from River Road this week and I desperately needed purple ones too. This dish features them flawlessly. I baked it on the bottom shelf @375 (do 400 if using a metal pan) for about 23 minutes until golden brown (and potatoes tender) and then tossed 3 small diced tomatoes over the top when I took it out of the oven. Have other amaranth inspirations? Please come to https://www.facebook.com/jenfood.az and share! What a lovely recipe! I enjoyed this so much, I think I will make it again soon. I put onion and garlic and pretty much every savory dish, so I sauteed an onion and couple cloves of garlic which I added to the mix! Thanks. Yum! I can’t wait ’til I get my share tomorrow so I can make it again! I definitely think some Chiva Risa Goat Feta would be totally perfect… Thank you for the idea!